Children have headaches just like adults. The good news is that headaches in children usually are not serious. But children do get migraines which can be chronic daily headaches or stress related headaches. The symptoms in children are different than adults. A migraine headache in a child is caused by an infection, high levels of stress or anxiety or minor head trauma. That twenty-four hour flu a child gets could very well be a migraine. Children experience vision changes, a sick feeling in stomach or vomiting is common. Bright lights, loud noises or strong odors help increase the head pain and enhance the already queasy stomach. In children, severe head pain often is completely relieved by sound sleep. 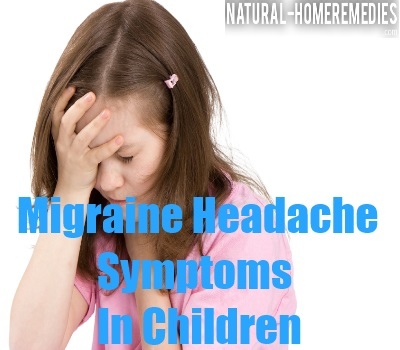 Although a migraine headache is considered relatively harmless the symptoms can interfere with a day of a child. Often a migraine will put a child in bed for a day. A child as young as five years old can experience a migraine. Preschool children experiencing a migraine attack usually look ill. They have stomach pains, vomiting and a strong need to sleep. The pain is expressed by crying, irritability, rocking themselves back and forth and wanting to lay down in a dark cool room and go to sleep. The age of onset of migraines is earlier in boys then in girls. From infancy to age seven years boys are affected by more migraines then girls. As the migraine headache continues into adolescent years girls get more migraines then boys. Children five to seven years old experience headache, nausea, abdominal cramping and vomiting. They also experience photophobia, phonophobia, osmophobia and need to sleep. Symptoms children experience are paleness of skin with dark circles under their eyes. Their eyes water, they have swollen nasal passages and are very thirsty. There is also an excessive amount of sweating as well as increased urination and possible diarrhea. As children grow older, headache intensity and duration increases and migraines happen at more regular intervals. Older children describe a pulsating and throbbing with their headaches. Childhood migraines often stop shortly after puberty.